THERE was a look of steely determination on Matt Ford’s face as he cleared the table to clinch the Cuestars Seniors Championship. 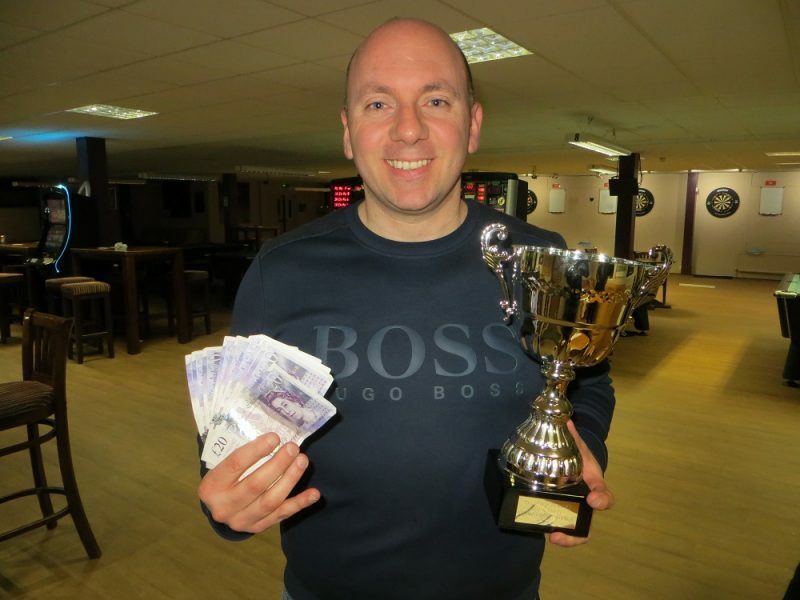 The 41-year-old from Martins Heron, Bracknell, had suffered three major disappointments over the past two seasons on the over-40’s snooker circuit before securing his first title. Ford pocketed £180 prize money after edging Neil Craycraft 3-2 in the final at The Crucible Sports & Social Club, Newbury. But Craycraft, who had won both of the events he entered this season on the Cuestars South of England Seniors (40+) Tour, may consider himself unlucky not to have won 3-0. Ford was struggling with his trademark long pots and, when they did go in, breaking down in the late teens or early 20s. Craycraft broke the back of the first frame with a run of 44. Ford squared the match on the blue. But it was the key third frame that suggested Ford’s name may have already been on the trophy. He took an early lead but was trailing by 29 points with two reds remaining after his opponent from Didcot had chalked up a break of 61. Ford eventually cleared the colours to win on the black. But he then gifted Craycraft the fourth frame by going in-off the pink from the last red. Both players broke down near the start of what looked like match-winning breaks in the decider, Ford on 22 and Craycraft on 25. Ford secured victory by firing in a long green halfway through a 47 clearance. “I was just determined not to waste another chance,” he said. “I just had to keep my head still. I had enough chances in the match so I had to take one of them. Last season, Ford agonisingly finished runner-up to ex-professional Mike Talmondt (Portsmouth) on countback and lost to John Hunter (Andover) in the Championship semi-finals. This season, he was second in the rankings again. Ford recorded the day’s highest break of 67 against Chris Rigby (Sutton) in the group stages and repeated the feat in his 3-1 quarter-final victory over rankings winner Hunter. He beat Woking tennis coach John Monckton 3-0 in the last-four while Craycraft dispatched rookie professional Billy Castle’s main sponsor Neil Herd by the same score to reach the final. Rigby, who finished the season in joint sixth place, failed to qualify from his round-robin group but bounced back to claim the Plate trophy. The invitation-only event for the top-20 ranked players on the Seniors Tour was sponsored by I AM Promotions and Hammant’s Cues. Matt Ford: 67, 67, 63, 57, 55, 55, 51, 47. Neil Craycraft: 61, 50, 48, 47, 44. Wayne Muddiman: 61, 48, 41. John Hunter: 44, 42, 40. GROUP A: 1st, John Hunter (Salisbury SC); 2nd, Neil Herd (Salisbury SC); 3rd, Andrew Darken (Chertsey SSNR Club); 4th, Jon Walker (Potting Shed, Aldbourne). GROUP B: 1st, John Monckton (Woking SC); 2nd, Neil Craycraft (Jesters, Swindon); 3rd, Martin Wallace (Crowthorne RBL); 4th, Herman Desmier (Bournemouth & District Constitutional Club). GROUP C: 1st, Dan Hammond (Chandlers Ford SC); 2nd, Phil Morgan (Chandlers Ford SC); 3rd, Neil Carroll (Chandlers Ford SC); 4th, Stephen Hills (Traders, Northfleet). GROUP D: 1st, Wayne Muddiman (Chandlers Ford Central Club); 2nd, Matt Ford (Sunninghill Comrades Club, Ascot); 3rd, Chris Rigby (Chertsey SSNR); 4th, David Stewart (Chandlers Ford SC). QUARTER-FINALS (£15): Ford 3-1 Hunter, Monckton 3-2 Morgan, Craycraft 3-1 Hammond, Herd 3-1 Muddiman. SEMI-FINALS (£40): Ford 3-0 Monckton, Craycraft 3-0 Herd. FINAL (£180/£90): Ford 3-2 Craycraft.